Iris Theatre presents a new, pertinent version of the ‘Arabian Nights’, turning Hoxton Hall into a wonderland of illusion. Rich colours, masks, puppets, dance and music blend and fuse with the narration to take us on a familiar journey, but down a different path. Nessah Muthy’s heartfelt rewriting of this centuries-old treasure adapts the framework of the story to show the strength and independent minds of women. King Shahryar finds revenge for his wife’s unfaithfulness by marrying a new wife every day and killing her the following morning. When he decides to marry Dunzayad, his young servant, her older sister, Sharazad, uses her gift of storytelling to buy time and save her. In doing so, she gradually sees behind the king’s brutal façade and challenges him, questioning her own feelings as well. Muthy also adds clever twists of gender within the tales, giving them a modern relevance. Director, Daniel Winder, masterfully interprets the script with art and inspiration. Jonny Dixon’s superb puppets and masks feed our imagination and enhance this youthful yet enlightened production. The lighting (Ben Polya) and sound (Filipe Gomes) add magical and dramatic effects and a constant stream of additional details holds our attention – Amber Scarlett’s resourceful set design, evocative music and dance (Sonum Batra and Nour Alkawaja) and colourful costumes by Maddy Ross-Masson. 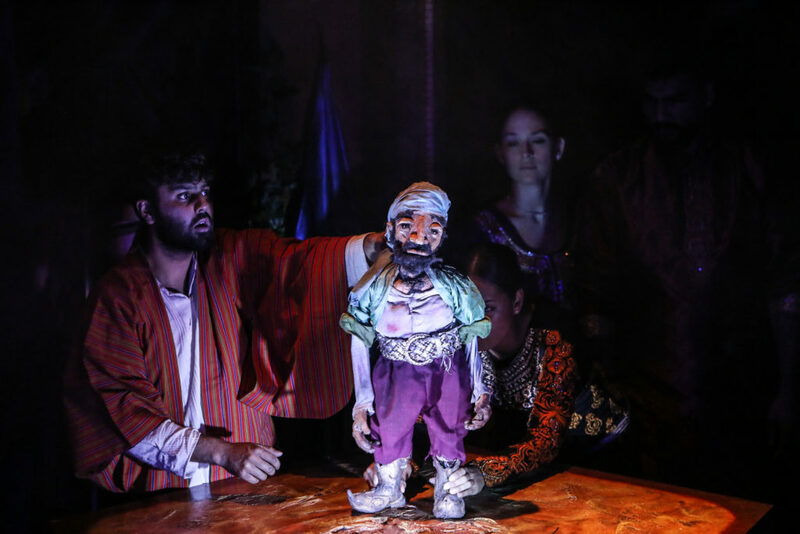 The well-chosen, multi-cultural cast poignantly reflects the rich origins of the ‘Arabian Nights’. The six actors cover a multitude of roles as well as manipulating the puppets with dexterity, allowing us to enjoy the fantasy. We not only hear of Ali Baba and Sinbad; brothers and sisters, princesses, husbands and wives, sailors, kings and queens and animals all play their part in recounting adventures, myths and morals. There are varied and vivid performances from Ikky Elyas and Maya Brittoa, Hemi Yeroham’s comic flair, Pravessh Rana’s powerful presence on stage, Izzy Jones’s portrayal as the spirited sister and a special mention for Sharon Singh as Sharazad, who elegantly holds the main plot together with the many narrative diversions. The first half of the show takes a while to flow. Once we break through the slightly ‘theme park’ feel of the repetitive, pre-show piped music, the imitation stone of the set (from the audience’s close proximity) and the initial impact of the broad acting, we can appreciate the huge amount of thought, work and talent. It is neither a children’s show nor more suitable for adults; seemingly, it has something for everyone. And, at two and a half hours long, there is plenty of time to find it.